Ok ok ok, this week let’s get down and dirty and talk about- money. Yes, I know a very touchy subject for some, but I felt it necessary to dive into the subject of “the gratuity” otherwise known as “tipping” in Sin City. Often an overlooked expense when planning your wedding so let’s delve in to this traditional practice. Let’s begin with a little history; in the 16th century guests at English mansions were expected to give a “vail” or a small amount of money at the end of their visit for the servants and the extra work they had to do while there were guests. The word “tip’ is actually an acronym, T.I.P. actually comes from “To Insure Promptitude” which is odd in and of itself in that a gratuity is not given prior to receiving services but rather after. The dictionary definition for the word “gratuity” is a gift of money over and above payment due for services or something given without claim or demand. Tipping is also a cultural practice. In a city like Las Vegas there are several opportunities in our day in which it has become customary to tip. In addition to the usual waiter or waitress we have become accustomed to tipping the valet parking attendant, the door man, the bell hop, the change girl, the showroom usher and the bartender to name a few. In fact tipping is SO customary in our city that the IRS gets their share of it as well. Employees that fall in to a job class defined as as tipped employee are often times paid a lower hourly rate because the IRS has made the assumption that the average amount of tips earned maintains the deficiency in the hourly rate. In many countries tipping is not a part of their day to day practices. Tips and their amount are a matter of social custom, and the custom varies between countries and settings. In some locations tipping is discouraged and considered insulting; while in some other locations tipping is expected from customers. In Japan for instance tipping is not a part of the culture. It is not expected and can cause confusion. Japanese people see tipping as insulting. Let me add one more twist to this whole tipping scenario for you, as if I haven’t given you enough to think about already. In some regions a service charge is automatically added to your bill. A gratuity and your wedding day… What’s expected? So how does this all fit in to your wedding plans? Las Vegas remains the wedding capitol of the world and we are privileged to work with couples from virtually every country and culture so what is a planning couple to do and what should a wedding service provider expect. 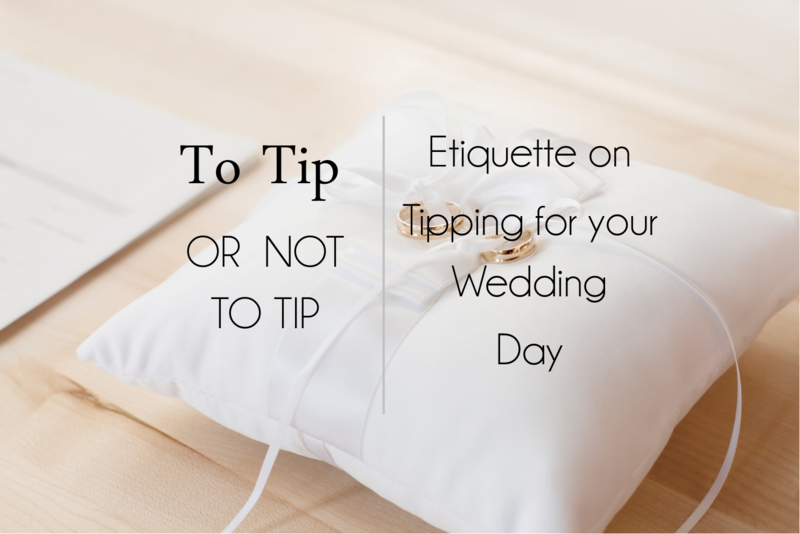 The concept of tipping is not itself difficult to understand but the who to tip and how much to tip those providing services for your wedding can be a little tricky to navigate. This being somewhat of a hot topic we turned to “The Knot” for some recommendations. Wedding planners won’t likely expect anything; however, if yours did a great job you can always offer a token of your appreciation. (Note: Non-monetary thank-yous like professional photos of the wedding for the planner’s portfolio can go a long way too.) Approximately 50 percent of couples do tip their planners — typically those with more opulent weddings. This type of staff includes the on-site coordinator, maître d’, and banquet manager. A service charge (typically 2 percent) is almost always built in to the food and drink fee, so check your contract. If the gratuity is not included, tip as follows. The Standard: 15 – 20 percent of the food and drink fee (based on labor, not the cost), or $200 – $300 for the maître d’. Join me next week as we discuss hair and makeup trials. Why you need one, what your goals should be and why you should invest in one. Until then, follow us on Instagram for more tips on bridal beauty. Previous Previous post: Why are makeup artists so expensive? Next Next post: How To Avoid A Wedding Day Beauty Disaster!